KerbEX is only for external application..
KerbEX can be applied with a sponge or a cloth or it can be sprayed. KerbEX should not be used diluted, diluting the product leads to less effect. During the first week apply daily covering a large area. Please pay attention not to apply KerbEx to mucous membranes or open wounds. During the second week apply KerbEX every second day, during the third week about every third day. You will recognize, that insect attac has reduced significantly. From now on you only apply KerbEX, when you observe, that insect attac is increasing again. According to satisfied KerbEX clients this will be every two or three days, during continuous rainfall the frequence may have to be increased. 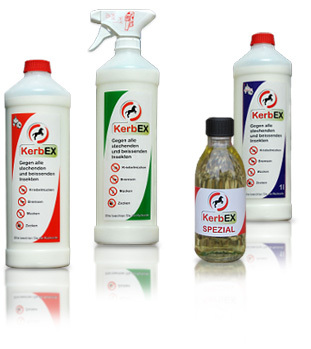 KerbEX Special is a pure oil against black flies. Apply only a very thin film to the affected part of the skin. When you treat the ear conch, pay attention to apply a sufficient amount for protection, but take care that nothing gets into the tympanic membrane. Following these application hints, there is no need to spray immediately before the ride proceeding from a midding insect attac. If you have any questions about our products, we are at yur disposal. 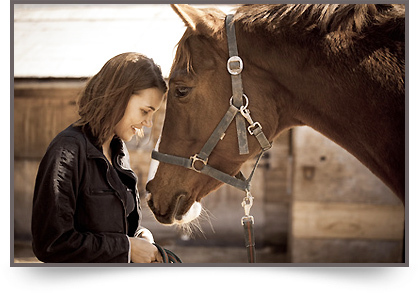 We wish you a nice time with your horse.